On the 10th of May, 1940, people around the world woke-up to very distressing news. Hitler's forces had invaded Belgium, Luxembourg, the Netherlands and France. Although not part of the continent, Britain would surely be next if Hitler could mount a successful invasion. Since it was obvious no one could meaningfully negotiate with Hitler, King George VI summoned Winston Churchill to Buckingham Palace on the same day as the Blitzkrieg ("lightning war") was overwhelming Belgium, Luxembourg, Holland and France. 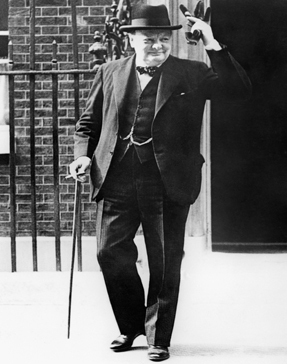 The King asked Churchill to form a government, thereby confirming Winston as Britain's new Prime Minister. This image, online via the Imperial War Museum, depicts Churchill on the day he became Prime Minister. As former "First Lord of the Admiralty," Churchill knew something about a country's need to protect itself at sea. That knowledge was key for both Churchill and Britain when Winston assumed his new duties. For example ... beyond invading Britain, Hitler and his military might had another way to cripple Britain and force the country's surrender. German U-boats could attack and destroy all the supply ships on which the United Kingdom depended. Admiral Karl Doenitz, Germany's head of the U-boats, began to employ that very strategy against Britain. German U-boats, especially during the early years of WW II, were very effective in preventing the Allies from shipping supplies to Britain. Churchill referred to their use as "the U-boat peril." Damage caused by attacking groups of U-boats, on convoys bound for Britain, was so substantial between the start of the war (in September of 1939) and May of 1941, that people in Britain were in danger of starving if the supply ships could not make it safely to the United Kingdom. Desperate to stop the U-boats from crippling or destroying ships traveling in the North Atlantic, Churchill needed a team of people to break the codes the U-boat crews were obviously using to communicate with each other. As it happened, the Kriegsmarine (the German name for the country's Navy during the war) had a sophisticated encryption system which appeared unbreakable. All branches of the military depended on a machine, called "Enigma," which made decoding German messages nearly impossible. Until ... a group of highly intelligent individuals began to gather at an old English country house located at Bletchley Park (around 50 miles, or so, from London). Churchill would later refer to these people as "the geese who laid the golden eggs and never cackled." British and German historical newsreels, compiled by Celeon999A and placed online through YouTube. Quoted reference is from Churchill's book Their Finest Hour - The Second World War, Volume II, at page 259. The full quote is: "The only thing that ever really frightened me during the war was the U-boat peril." Bos, Carole "Historical Footage - The U-Boat Peril" AwesomeStories.com. Oct 07, 2013. Apr 18, 2019.